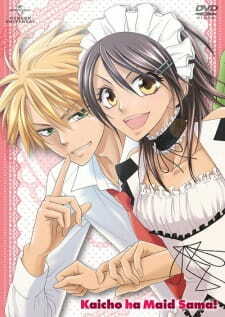 Anime Review: Kaichou wa Maid-sama! A hilarious story about a high school girl that acts all touch and mighty but then secretly works at a Maid cafe. Interesting as it sounds, this will completely make you laugh so hard your stomach will hurt. I must admit, I was pretty sceptical at the start of this anime. I though, this is going to be one weird anime. I as wrong. The unique setting and back story of the characters really made this anime interesting than other 'romcom' anime out there. The story was really hilarious and interesting from start to end. Every episode was just exciting to watch as the main protagonist tries using many different methods in order to cover up her secret whilst dreaming up funny scenarios and outcomes that may happen. The lives of these characters have never been so funnier. The art was slightly average. Although the scenery and background art was of high quality, the characters themselves lack a bit of detail. In the end, that did not really matter as the characters were always in either their school uniform or some cosplay attire. I enjoyed laughing at every character even if they are not meant to be funny. Voice acting was to the point and accurate. No complaints here. The theme songs were appropriate and the use of background music in various scenes really contributed to the overall mood that the anime brings out. I can spend so much time telling you about all the characters but I won't bore you. Simply put, the characters were all memorable and humorous in their own way. I totally loved the main protagonist as she tried to hide her secret in which she is successful most of the time, but something embarrassing always ends up happening. The main male protagonist is pretty funny as well as he teases the girl protagonist a lot. The misunderstandings are plenty and funny things always happen to all the characters. You will love the characters. Overall, I really enjoyed this anime. Even though its a shoujo anime, I still enjoyed it every bit. The funny moments are funny, and the story never gets boring. Its definitely an anime you should watch and enjoy and take a laugh at. The romance is there, but not what you will expect. Story is really well played out. Some minor details are left out but are not that important. Well drawn art with fluid animations. Characters lack fine detail but can be easily overlooked. Voice acting was spot on. Theme songs were appropriate and background music was well selected. Loved all the characters, even the weird and disturbing ones. Its totally finny in every way you look at it. You have to love 'romcoms' to fully understand and appreciate this anime. Excuse me, please let me get my puking bucket. This is a cliche shoujo love story. Watching this anime once again verifies my major dislike for shoujo sappy love stories; and gives me more reason to only stick to shounen stuff. I cringed every five minutes and twitched my left eye every three minutes of it. The leading male character was too perfect, he makes me spew, throw forks at him, shave his hair off, throw him into a lava pit, I think you get my point. The main female character made the typical mistakes and hence the flawless hero rescues her during the most perfect timings. I mean how stupid can the female be to not notice that there's this horde of guys falling for her. Gosh she's such an idiot and such a big meanie. She never cleared up any of those unrequited feelings - man, I feel sorry for those guys who love/idolize her. I want to smack/tackle/drown/dangle her. She doesn't deserve that perfect boyfriend at all!